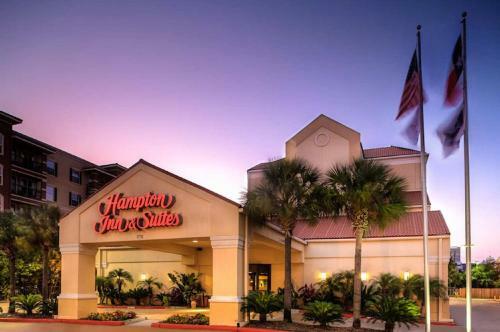 Between NRG Stadium and the Texas Medical Center and conveniently located close to motorway I-610, this Houston hotel offers complimentary hot breakfast every morning. Rooms feature free WiFi and a TV. A microwave, refrigerator and coffee machine are provided in each room at Hampton Inn & Suites Houston-Medical Center-NRG Park.A work desk is also available. The private bathroom features curved shower rods and a hairdryer. On-site at the Medical Center-NRG Park Hampton Inn and Suites, guests can enjoy a modern fitness centre, complete with an outdoor pool, as well as a convenience store. Major area attractions, including Houston Zoo, Rice Stadium and the Houston Museum District, are all located within 3.5 km of the hotel. The city's light railway system is also easily accessible and offers instant access to many other nearby sites. the hotel Hampton Inn & Suites Houston-Medical Center-NRG Park so we can give you detailed rates for the rooms in the desired period.